You’ve worked hard to gain Twitter followers and Facebook fans for your nonprofit – but now what? Where's the ROI? For small nonprofits, in particular, moving those online supporters from “Like” to concrete action to get your work done can be a real challenge. With Sparked – billed as the world’s first micro-volunteering network – “anyone who wants to help can tackle a challenge online for you,” free. Nonprofits post challenges (work requests for small projects), identifying the cause area they work in and the skills needed to solve the challenge. Micro-volunteers from all over the world log on, and solve the nonprofit challenges that match up with their individual interests and professional expertise. Sparked doesn’t just hook up individual volunteers with nonprofit causes that need their skills. It also partners with companies to provide a turnkey solution to employee volunteering, pairing the personnel of some of the world’s top companies with nonprofits in need of their skills. The aim, explains Sparked on The Extraordinaries Blog, is to make volunteering “as convenient as using Facebook” for both nonprofits and online volunteers. Check it out – volunteers are standing by! I love Sparked! We've gotten some photoshop graphics converted to vector (so they can scale up and still look good) and gotten advice for marketing text on our site that resulted in an immediate increase in folks asking about volunteer opportunities. I've also been able to return the favor by helping other nonprofits with their challenges. 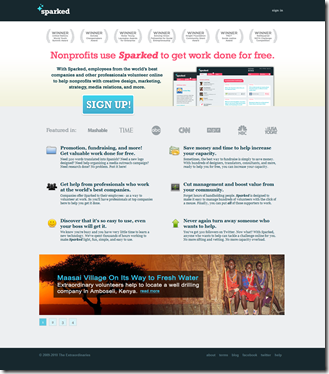 This site fills a niche for small (and large) nonprofits perfectly. That's great, Nicholai - especially that you've been able to return the favour! It would be great to hear of others' experiences with Sparked, too, and what kinds of help they've been able to get (or give).